Strapping - Polyester Black, 1/2", 16" x 3", 0.015, 500 lb, 4500' HPD1250 ? Strapping - Polyester Black, 1/2", 16" x 3", 0.02, 600 lb, 3600' HPD1260 ? Strapping - Polyester Black, 1/2", 16" x 3", 0.025, 775 lb, 2900' HPD1277 ? Strapping - Polyester Black, 1/2", 16" x 3", 0.028, 820 lb, 3250' HPD1280 ? Strapping - Polyester Black, 5/8", 16" x 3", 0.02, 750 lb, 2850' HPD5875 ? Strapping - Polyester Black, 5/8", 16" x 3", 0.025, 900 lb, 2200' HPD5890 ? Strapping - Polyester Black, 5/8", 16" x 3", 0.03, 1100 lb, 1800' HPD5811 ? 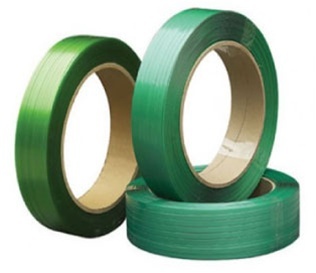 Strapping - Polyester Green, 1/2", 16" x 3", 0.02, 600 lb, 3600' HPD1260 ?